Satellites must often point a device continuously at an object as the satellite and/or object move through space. On an interplanetary mission, a movable antenna reduces the radio requirements to communicate across large distances to Earth and an articulated propulsion module enables increased spacecraft control with fewer thrusters. Continuously tracking the sun with the onboard solar array will maximize power generated. With these devices, connections are typically made between the articulated device and a fixed base, around which the devices rotates in one or more axes while tracking. Implementing these connections can be a challenge in size-constrained applications or when uninterrupted tracking is required. Within the small satellite realm, some new solutions (e.g., using a Canfield joint) have recently been developed to address this problem. Given the mass and volume constraints imposed upon CubeSats, the authors feel that none of the existing solutions solve the problem elegantly or efficiently. A new, simple two degree of-freedom (2-DOF) joint – the Hemispherical Anti-Twist Tracking System (HATTS) – is proposed that allows tracking through a sphere with continuous rotation while avoiding any twist in the connection(s) from the device to the base. This design is notable for its ability to continuously rotate and for its simplicity; the HATTS joint has a reduced component count and fewer interfaces between moving parts than competing solutions, thereby potentially increasing pointing accuracy while lowering cost, mass and complexity. In the CubeHATTS joint – a CubeSat-specific implementation of HATTS – two identical, symmetrically-mounted motors are rigidly affixed to the chassis of the satellite, and provide the two DOFs via dual coaxial gears operated either synchronously or differentially. CubeHATTS is able to track continuously through a hemisphere and when stowed, the entire system fits in a volume of approximately 0.25U (10cm x 10cm x 2.8cm). 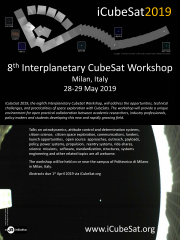 The authors believe that by enabling continuous pointing of a device without significantly impacting payload volume, CubeHATTS will help facilitate a new class of interplanetary CubeSat missions.